Guess what? It’s Wednesday and that means it is time to talk about food! Last week I mentioned I was sprouting lentils for the first time and I used them in a new dish I threw together on Thursday. I have been obsessed with lentils these last few weeks so finding a new way to “cook” them was so much fun. 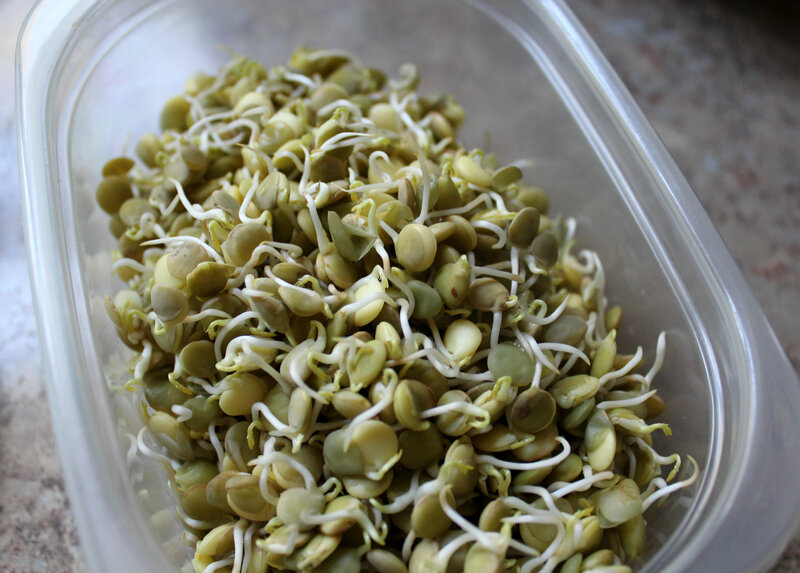 And that’s the thing, you can eat sprouted lentils completely raw right after sprouting, no cooking required…just days of advanced sprouting. But I have some black beans sprouting on my counter this week, I hope they work the same as the lentils! And don’t you think they are so cute? I love the tails! So I really had no idea what I would use them in, so I looked in the fridge and remembered I had some nice golden beets that needed to be used and I found a box of frozen artichoke hearts in the freezer. 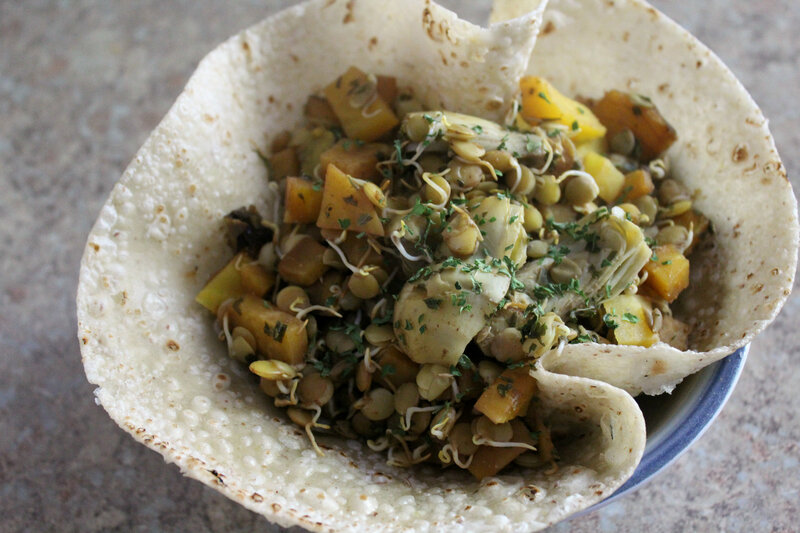 Then it hit me, how about a warm sprouted lentil salad? A nice way to slowly welcome in the fall…reluctantly. – First you need to roast your beets. So preheat the oven to 500°F, peel the outer skin off the beets (my hands didn’t turn red this time! ), wrap in foil, and place in the oven for about 1 hour. When they are done, take them out, unwrap, and roughly chop them into small bite sized pieces. 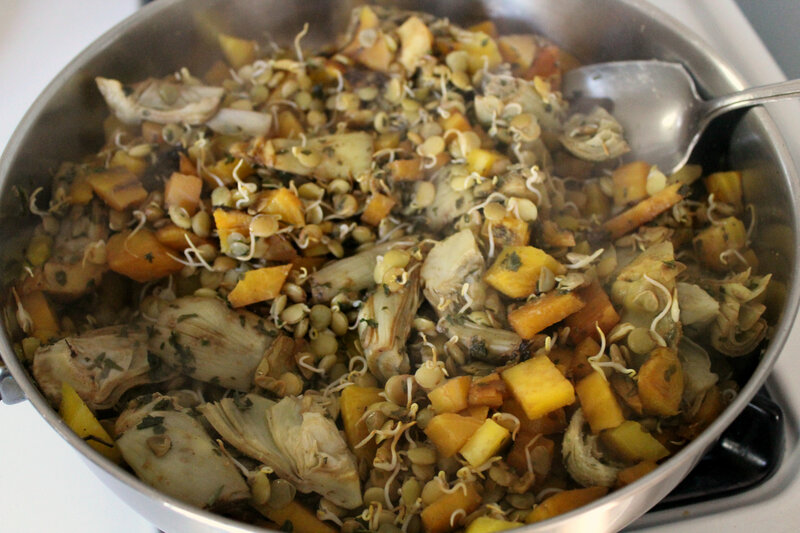 – Next get a large saute pan and add the beets, sprouted lentils, artichokes, balsamic, Dijon, and all the spices. Then mix and toss it all together. Add about 2 TBS of water and place the pan covered on medium heat for about 15 minutes, stirring every 5. – Remove from heat and serve! You could eat this over greens for a light lunch or over grains for a power dinner. I served mine in a warmed brown rice tortilla (30 seconds on high in the microwave) and pressed into a bowl 😉 O, and don’t forget to top with some more parsley! Remember to link up your favorite or current eats to Jen’s fabulous WIAW! 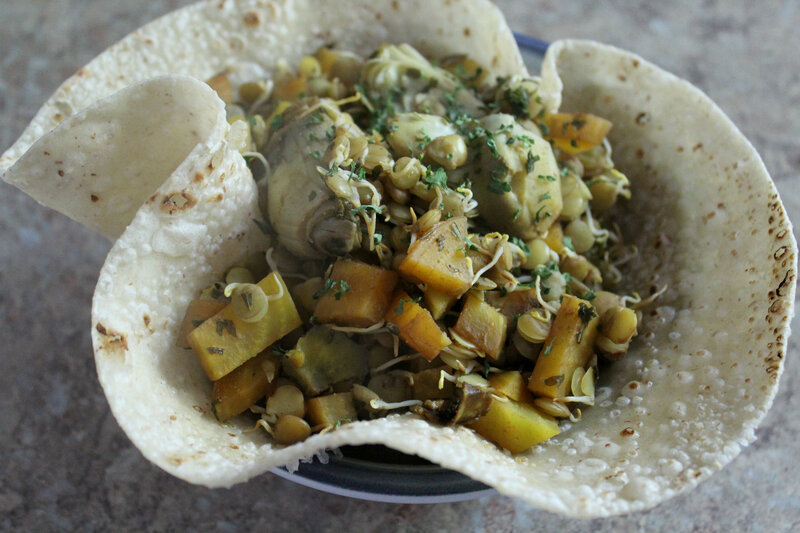 How do you like to used sprouted legumes? Any great recipes I should try next time? What is you current obsession (food or non-food related)? Lentils, Pumpkin, and GRANOLA! Let me know if you give it a try Lindsay! I have tried that’s with beets before, but find it really messy! This looks so good! Thanks for linking up to my Friday Favorites last week!! I hope to see you again tomorrow! Of course! I will be there to link up! I heard about vegemite from another blogger who received it from a friend in Australia! We don’t have it in the states, but it sounds interesting! This looks delicious. It is so different from what I would normally make, so I can’t wait to try something new! I hope you like it! Let me know if you try.